US Embassy provides evacuation flight, closes Consulate in Juba as sectarian fighting continues. The US ordered its citizens to evacuate South Sudan Friday, after more than 1,000 people have been killed in clashes between rebels and government troops. "On January 3, 2014, the Department of State ordered a further drawdown of U.S. Embassy personnel from Juba because of the deteriorating security situation in the Republic of South Sudan," the US Embassy announced on its website. "We continue to urge U.S. citizens in South Sudan to depart the country." The Embassy provided an evacuation flight to the nearest "save haven" country for US citizens Friday morning, and announced that it would be closing its "consular services" to US citizens Saturday. However, the US has not withdrawn its presence entirely from the region, according to one official. "We are not suspending our operations. We are just minimizing our presence," Ambassador Susan Page told Reuters. Violence erupted in December, the result of a power struggle between South Sudan President Salva Kiir and his former deputy Riek Machar, who was fired in July and is recently accused of plotting a coup. The conflict further shows an ethnic divide in the state founded in 2011, as Kiir is an ethnic Dinka, while Machar is from the Nuer tribe, reports BBC. In response to the fighting, UN Chief Ban Ki-Moon asked the UN Security Council last week to dispatch 5,500 more peacekeepers to the country. Peace talks have been underway between the two sides - brokered by Kenyan President Uhuru Kenyatta and Ethiopian Prime Minister Hailemariam - but the fighting has continued. 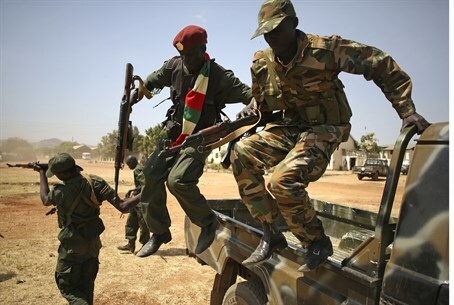 On Wednesday, Foreign Minister Barnaba Marial Benjamin called the area a "war zone."